WordPress Nulled Themes: Should You Use Or Not? StayMeOnline is not only a blog where I come and share my experience and knowledge which I earn day by day with my blog, Apart from a blog we also have a community where people can come and get in touch with each other to share their knowledge. I have created that for allowing users to share their queries and get a solution for them, If you are not aware of the StayMeOnline Forum then join right now. We discuss many things there but one thing happened recently and I think that I should share this with you. When someone starts a new blog on WordPress, there are many steps which he should go across and be choosing a theme for the site is quite important. As a beginner, most people have the tight budget so this is the reason they can’t afford premium theme when starting a new WordPress site. But everyone knows that premium themes are quite good than a free theme because of the features, more flexible to customize. This is not only with the themes rather also applies to the WordPress plugins, some plugins are not free and we can only use them after purchasing. I know free alternatives are also available but do you think they are good as premium plugins are? Many of us want to use premium because maybe only premium plugin or theme can fulfil their requirements. But they can’t afford to pay money to purchase the license. In this situation, where they need premium plugin or theme but can’t afford to pay, they start searching ways to get the exact same for free. And come to know about the WordPress Nulled Themes or Plugins. Nulled themes are the hacked or cracked version of the premium themes, these themes are created by playing with the codes of a theme to make it available for free. In more simple words, Nulled themes are the copies of premium themes which is free to use but these themes are created in an unethical way or illegal way. When you install these themes on your WordPress website, these scripts work for their developer who has created that nulled theme and it might harm your WordPress website. These nulled themes are often the reason behind the hacked website, I am not saying everyone will face this if they use nulled themes but in maximum cases, it happens. These nulled themes are causing original developers to lose the money which is totally theirs, They creates themes and plugins by investing their hard work, time and money on it and someone comes and steal all their rights, cause them to lose their earnings. For a while, Imagine you are the developer who creates premium themes and exacts same happens to you, how bad will you feel? This is not ethical to make cracked copies of the original premium files like themes and plugins, wondering, should you use those nulled themes and plugins or not? Should You Use Nulled Theme? 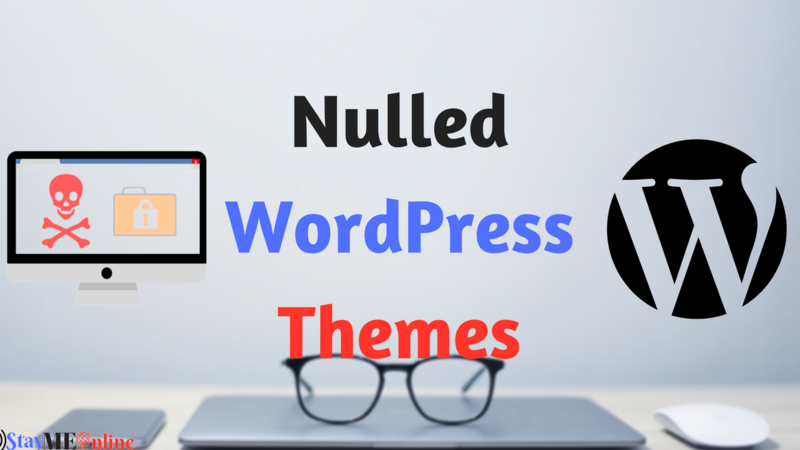 As I shared above that Nulled themes are the themes which are created illegally and unethically so you got to know that you should not use those themes and plugins. I know using them can save you money and also give you premium benefits without spending a penny. Let ask a question to yourself, Are they fools who purchase Original Premium themes? Tons of people who has a WordPress site purchases premium plugins and themes by paying the amount for them. Are they fools?, why they are wasting their money? Yes, you read that right It might destroy all your website, I have seen many peoples who have faced the same after using nulled themes for their WordPress website. WordPress Nulled themes and plugins are less secure than the original premium theme, they known to carry malware in them and can harm your website. The developers who create nulled themes, they play coding game with the original theme files and this can harm the security of the theme which original has. This all happens because of the malicious codes which they put on the theme files to crack it, these malicious codes are hard to find. Security is the important part of any website and we can’t compromise with It, a less secure website means easy to hack for the hackers. And having a less secure and easy to hack website cause the loss of data. Privacy is another an important factor for any website, visitors come to our site and put their personal information like email, name and phone number. And if you have an online store or a website where you need to accept payment from the users then it can be very dangerous for you if you use WordPress Nulled themes. Nulled themes contain some malicious code so it can also contain codes which work to steal the information. Your information can be used by hackers or for any illegal purpose as well, and it can be sold to someone to get money out of it. It will not only harms you rather it can push your customers/visitors/users into risk. We invest months even years to build a reputation in search engine which known as SSearch Engine Optimization, in these months/years of periods we did hard to get organic traffic and good SERP ranking. Using Nulled themes can destroy your SEO ranking which you built after doing hard work on Optimizing your website. It can result is decreasing organic traffic and even you might be get punished by Google. Nulled themes sometimes created for stealing SEO benefits, it contains malicious codes which aimed create redirection which can force your visitors to land on another website it cause you to lose traffic. These malicious codes are invisible by the human eys but Google can easily find them which result for you in deindexing your web pages or lose in ranking. WordPress theme and plugin always launched new updates after a certain time which help to fix bugs and add new features. You will get notified of new updates even if you are using free themes and plugins. When you purchase a theme and get license officially then you are able to get each and every update from the theme developers. You will never miss any updates their side and on the other hand, if you are using the Nulled theme so you will never get an update on the theme side. Launching a new updates means that old version has some issue which has been fixed with new updates if you are not updating your theme or plugin then your website will start creating errors and misbehaving which you can’t afford. You will definitely face this if you use nulled themes because there is no scope of updating into the new version. Premium themes have always ready for support system which helps their customers in every small and big issue with the themes. They allow their users to share their queries and issues on the support forms. Original themes provide Documentation and videos tutorials for their customer to guide step by step. But if you using Nulled themes for your WordPress site then you are missing all the advantage of premium support system so if you get any issue with the themes you are using in future that theme you will not get any support from their side. You are only one who is responsible for every errors and issue and you’ll have to fight with that alone. Some people argue that the WordPress nulled themes are a tiny piece of software and I am using because I can’t afford to pay and still I want to use that. They don’t know they are stealing someone rights by using his work without paying for it. Think for a while, the theme is the result of someone’s skills, talent, someone created the theme without sleeping many nights. By doing this, you are preventing them from doing new innovation. The original developers not only invested their skills, time and money rather they have created a support system, documentation, created website and hired staff for the support. Let imagine, you are a theme developer and created an awesome theme after this fixed a price for that, someone created a pirated/cracked version of the theme you created. Will anyone pay for your theme? Instead, they can get your theme for free. this is stealing someone right, you have created a theme by investing time and money into it but after successfully launched, you are not getting the money which is your right because someone created a copy which is totally free. Will you ever create any theme again in future? If you will not think to create another theme after facing this so no one will, by using Nulled themes you are stopping people from creating innovation. Using Nulled or Pirated themes can destroy your whole website or might your website hacked, I am not saying that your website will definitely get hacked or destroyed. But why even think to take any risk? I have seen many peoples who have lost their website because of using NULLED THEMES and maybe you will not face this. But still, you are not doing ethical work, you are stealing someone innovation and taking all the money away from the original developers. You have read all the reasons why you should not use NULLED themes or plugins, there are many free themes available if you can’t afford to buy premium theme then you can use them. I hope now you understood my point and hope you will take care of this If you liked this post and found it helped them must share it with others to make them aware. We have one discussion on the StayMeOnline Forum where we are discussing the same so if you have anything to share then must share there, click here to go to the discussion. Thanks for the great article I totally agree with you as because I recently to research on this topic and I found the same. Great Post. Explained Briefly. I am also using a nulled theme. I will stop using it, and buy the original version of the theme.